StubHub Center formerly known as The Home Deport Center between 2002 and 2013, is a multi-purpose sports stadium located on the Campus of California state University in Carson, California. The 27,000 capacity soccer stadium is the largest purpose built stadium in Major League Soccer and is home to both LA Galaxy. Opening on June 1st 2003 and built over the course of a year, StubHub centre was only the second stadium to be purpose-built for soccer in the MLS era after following the lead set by Columbus Crew’s Stadium in 1999. With a capacity of 27,000 it is currently the biggest dedicated soccer stadium in MLS although CenturyLink, The Citrus Bowl and Yankee Stadium all have more seats heading into the 2015 MLS season. Costing over $87 million to build which equates to just over $112 million by today’s standards, some of the money has been recouped through the sale of naming rights. Currently known as the StubHub Center since June 2013, the ground was initially known as the Home Deport Center for the first decade it opened. Rather than being to referred to as a stadium, the facilities located on California State University in Carson are known collectively as a “Center”, and in total cost $150 million. These include a 2,450 seat velodrome, an 8,000 capacity tennis stadium and an outdoor athletics track which can seat up to 20,000 fans with the addition of temporary seating. 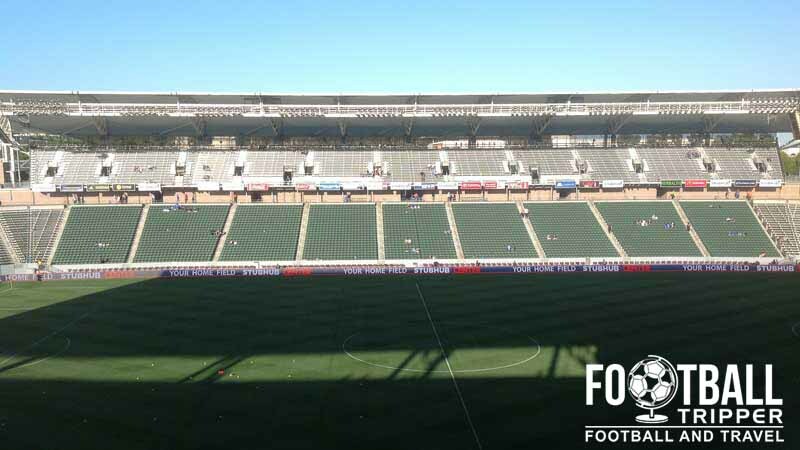 Designed by Rossetti Architects who have built a total of six Major League Soccer Stadiums to date including Toyota Park, Rio Tinto Stadium and the Red Bull Arena, the StubHub Center is most commonly associated with soccer, although it also annually hots the Vans Warped Tour concert. The most high-profile Soccer matches at the StubHub to date have arguably been the 2003 MLS All-Star game, and five MLS Cup finals. Most recently in December 2014 Los Angeles Galaxy defeated New England Revolution 2-1 in to lift their fifth title, giving USA record goalscorer and club icon Landon Donovan a real Hollywood ending after he announced his retirement from Soccer. 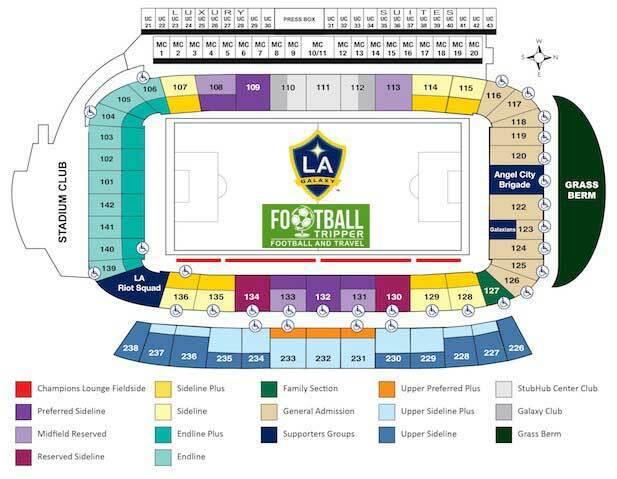 StubHub Center Soccer Stadium is comprised of four stands: North, East, South and West. The two nearest pubs are the Overtime Bar & Grill, and Buffalo Wild Wings which are very much in the classic American sports bar mould. Located next to the campus of a University there are numerous cheap franchise options dotted around the place within a 2 mile radius including a McDonalds, Starbucks, KFC and Domino’s Pizza. There’s even the Carson Mall 10 minutes away which has more sit-down type restaurants such as Denny’s, Olive Garden, and Five Guys Burgers and Fries. Inside the stadium there are numerous concession stands which sell everything from simple Nachos to a Farmer John Hot Dog meaning there’s no possible way that you will starve during the match. 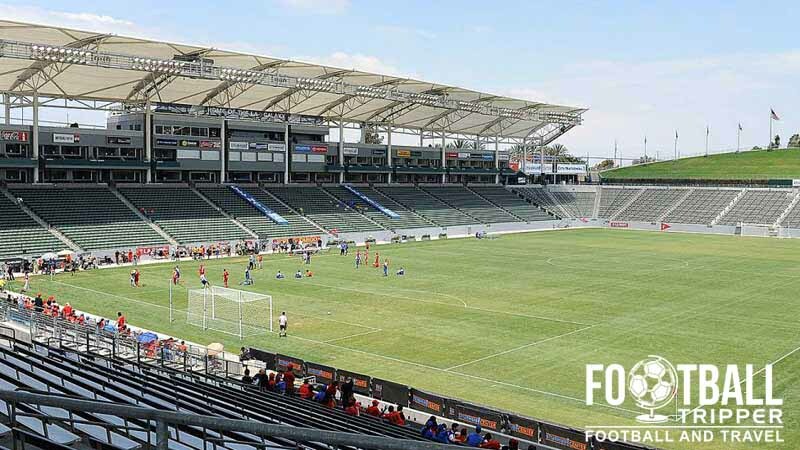 LA Galaxy offer fans the chance see the usually restricted access area at StubHub Center up close and personal by booking a place on the official Stadium tour. Tours are available between Tuesday to Friday across two slots (10.00 am and 2.00 pm), and can be booked by visiting this page. A school tours the Stubhub Centre and takes in LA Galaxy’s locker room. Please note that attendees in groups larger than 35 will receive a $2 dollar discount on ticket prices, however this only really applies to schools. No one has that much friends. 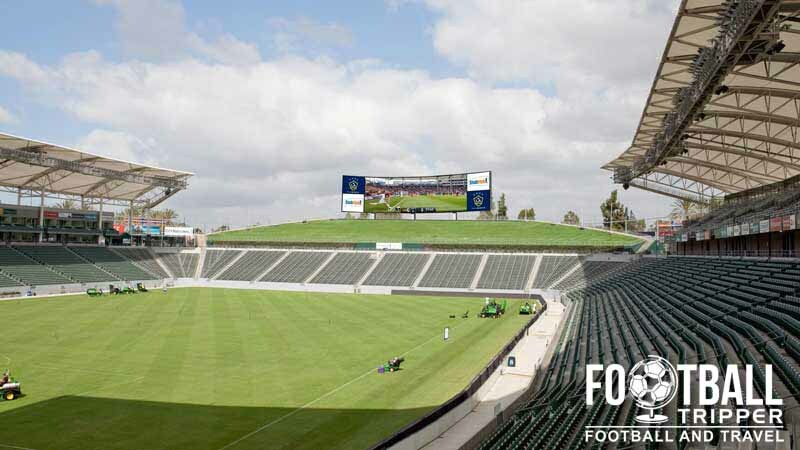 Tickets to see LA Galaxy play at the StubHub centre can either be purchased in person at the stadium’s box office in the lead up to the match or online via AXS Tickets who are the club’s preferred ticket vendor. Please note that ticket prices listed here are illustrative, subject to change and do not include booking fees. Located more or less on the campus of California state university the Stubhub centre enjoys good transport links although mainly for on-road vehicles. The main entrance to the Stubhub! Center!!!! Previously known as the Home Depot Park with no exclamation marks. The StubHub centre is served by up to 18 car parks which contain thousands of spaces, and providing that you follow relevant signs driving is really straightforward. The stadium’s operators have even put together a complete parking map for you to pinpoint exactly where you wish to park. Cash only. As most fans choose to drive to the see LA Galaxy play Soccer there isn’t widespread information concerning bus and metro routes. The official Stubhub website advises fans to visit Southern Californian Transport to find available bus and rail routes. Galaxy fans proudly displaying the club’s signature blue and yellow colours. Beer included. The closest bus stops are Avalon/184th to the west of the stadium served by 45, 205 and 246 and Victoria Street at Rainsbury Avenue which is served by the brown number 6 or the white 130. 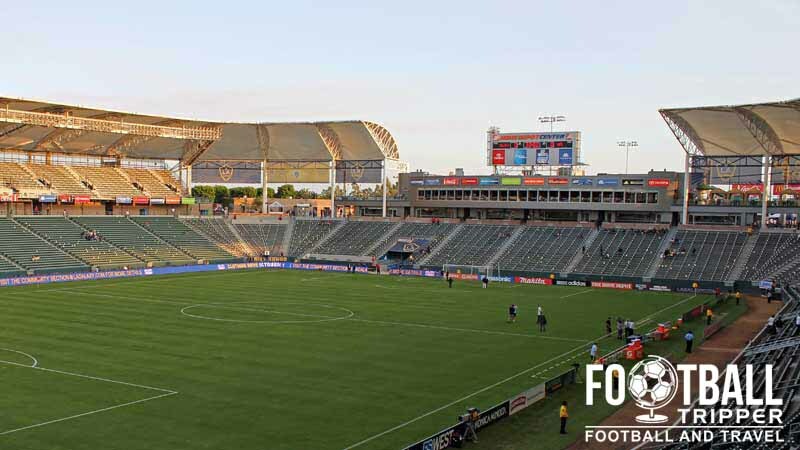 There are a dozen or so affordable hotels within 10 minutes of the Stubhub Center, with most of the options either allied to the Gardena Freeway which runs horizontal or the north/southbound Interstate 110. Choices include Travelodge Inn, Carson Plaza Hotel and Willow Tree Inn Los Angeles.